Somewhere between camping-out-is-not-really-comfortable-any-more and wanting to wake-up-with-nothing-but-open-space-in-front-of-me we found the 29 Palms Inn at Twentynine Palms, CA. 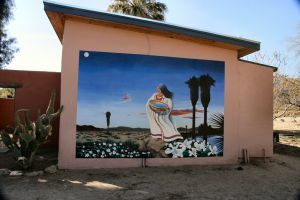 Perched on the edge of the desert it offered adobe bungalows facing a 180 degree view of prairie and mountains. In the dawn light it crawled with critters… roadrunners, quail and especially desert cottontails. That was twenty years back and we were there to visit Joshua Tree National Park, just a few miles away. The Inn was a memorable stop, surrounded by serenity, with good steaks in its simple dining room. 29 Palms Inn had been built around one of the few natural California desert oases. Last month we returned to hike the park and enjoy dinner at the Inn. And to see if all those bunnies were still hopping around the palm fringed oasis. Native Indians used this high desert for gathering nuts and berries. Well marked interpretive walks throughout the park point out the edibles. The 1800’s brought cattlemen and their counterpart, the cattle rustler. One lovely walk is through the striated cliffs and boulders of Hidden Valley, an old rustler hideaway. Miners in search of gold and silver left their mark in the hills. 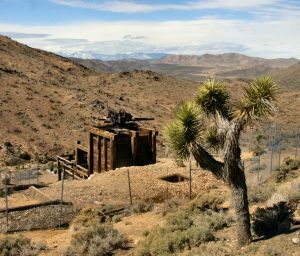 Lost Horse Mine is a worthy 4 mile round trip hike to a fascinating compound of left equipment and wood frame buildings. The park, which is celebrating its 75th anniversary this year, has been around almost as long as 29 Palms Inn. By 1920 a few primitive wood cabins were built about a mile away for the use of miners and cattlemen traveling through. In 1928 the structures were hauled over to the oasis, scattered beneath the tall palms and opened to welcome tourists. Over the years 29 Palms Inn evolved with the expectations for better accommodations. The adobe bungalows and wood cabins were fitted with modern amenities. The swimming pool, restaurant, art gallery and gardens were added. Each improvement was done with care to retain a feeling of peaceful spaciousness. Today the Inn exudes a feeling of old fashioned hospitality. Everyone is free to wander around the oasis or out into the open desert. The Inn is particularly comfortable in spring, between the cold winds of winter and searing temps of summer. Spring is also the best time to visit Joshua Tree Park for the mild temperatures and wild flowers. We arrived for dinner at 29 Palms Inn and the road house style restaurant was hopping. A convivial bar was full of locals sharing stories over their beer and cocktails. Families were ordering steak dinners enhanced by baby greens with yellow beets and roasted tiny red potatoes harvested on the property. A guitar and banjo duo added standard tunes to the lively atmosphere. Before we took our table we stopped by the oasis, a black pool of quietude hidden in its necklace of palms. Adjusting to the fading light we spotted the bunnies, descendants of those we had seen twenty years ago. For thousands of years they have gathered at this oasis during the edges of the day. Under the stewardship of the Inn I expect that to continue for many years to come.